Only six of the nineteen sites on the Solo Blog Index gained this week, but they were enough to pull the average up after last week’s loss. The Team Blog Index pulled out a second straight weekly gain. 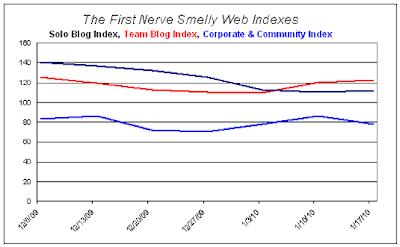 After rebounding last week, the Corporate & Community Site Index dropped back to its level of two weeks ago, pulled down by Sniffapalooza.